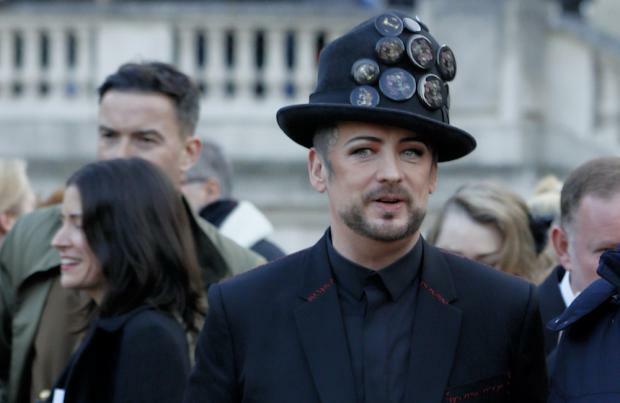 Boy George reflects on his "spiritual growth" on Culture Club's new song 'Life'. The 'Karma Chameleon' hitmaker and his bandmates have released the second single from their first album in 20 years, which is inspired by the late Beatles frontman John Lennon's famous quote: "Life is what happens to you while you're busy making other plans." George, 57 - who has previously battled drug and alcohol addiction - touches on recovery and also takes into account his life achievements on the track, which he says also carries an "uplifting" message of "hope". He said: "John Lennon said 'Life' is what happens while you are busy doing other things, but sometimes you have to stop and look with sadness and pride at what you have done and created in your own life and value the rich complexity of it! As the lyricist of 'Life' I wanted to express something truthful, honest and bare while carrying an uplifting message of hope. It's my story but it's a story so many people will resonate with. "A story of recovery, transformation and the start of a brand new journey which has already brought Culture Club well deserved accolades. It's a song about second chances and new beginnings, enlightenment, spiritual growth and personal redemption." The album title track follows the release of the lead single 'Let Somebody Love You'. The group - which also features Jon Moss, Ro Hay and Mikey Craig - had previously performed the song live but had never released a recorded version of the track. The song features the lyrics: "Love is revolution/War and famine too/If you've the hunger in your heart/Let somebody love you." The new album, which is available for pre-order and is released on October 26, will be followed 'The Life Tour', which will also feature Belinda Carlisle and Tom Bailey from Thompson Twins. It kicks off in Nottingham on November 9 and calls to 11 cities, ending in Leeds on November 23. George said of the tour: "We put together an amazing show that is going to be filled with hits and fabulous memories." Visit boygeorgeandcultureclub.com for ticket details. The 80s pop band fronted by flamboyant androgyne Boy George who brought us the ever catchy 'Karma Chameleon' head back on the road.